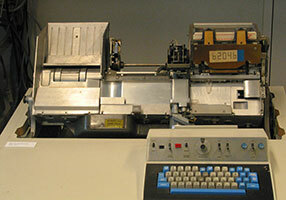 Many punching machines of this type (and similar machines from other manufacturers) were used at the University during the 1970's and 1980's. When punching a computer program onto a deck of cards you had to be extremely careful not to make any typing errors. The only feedback during typing was an indicator telling how many characters were entered. 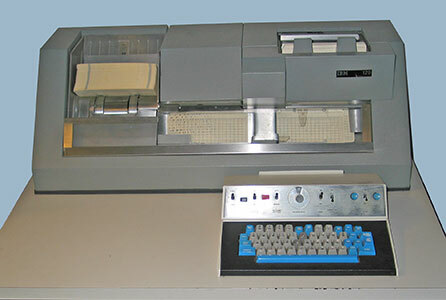 If you had the good luck of using a machine with a fresh ink ribbon, you could read your typing, but only after the card had been punched. For maintenance, the enclosure can be removed easily. The mechanics unit can be tilted for easier access. In the lower part of the 129 is a wirewrap backplane with plugged-in circuit cards. The machine's logic is built from SLT hybrid circuits. Behind the electronics compartment is room for two binders with a parts catalog, analysis procedures manual, maintenance theory and logic diagrams. 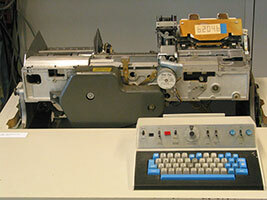 This machine was donated by the Institute for Pre- and Protohistory of the University of Amsterdam. A detailed description is given on Wikipedia.